In 1982, the Ella Lyman Cabot Trust awarded me a grant for documentary work in a Greek village because I expressed “bravery” and “venturesomeness” when I diverged from teaching biology to design and teach a course in cultural anthropology and to edit the oral history, You May Plow Here: The Narrative of Sara Brooks (Norton, 1986). During my pivotal two-year stay in the Peloponnese, I began to record villagers' stories on tape and on film. 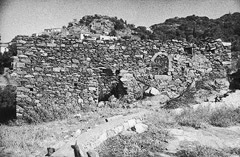 Eventually, I published the village narratives and photographs—along with accounts of my own experiences in Elika and gossip I overheard about “the American girl”—in my book Dancing Girl: Themes and Improvisations in a Greek Village Setting (Fundamental Note, 1991). Simultaneously, I yielded to the intuitive urge to have a home of my own in Elika—I purchased and began single-handedly to restore a roofless ruin long used to corral sheep. After seven seasons of Herculean effort, the house became habitable. Stories about the house restoration enrich Dancing Girl. As the author of Dancing Girl, I took great delight in reading my stories aloud to audiences. Then, one time, I boldly set the book aside and stepped into the role of storyteller. Eventually, I also wrote and performed the dramatic monologue, “Dancing Girl: An American Woman’s Greek Village Odyssey.” Richly anecdotal, the monologue allowed me to share directly with listening audiences the people, places, and events in Greece that have affected me profoundly. Currently, I offer “Building on Memory,” a multi-media presentation. Reflections upon my lifelong pursuit of insight and freedom through creative self-expression are set against a backdrop of my dynamic and revealing paintings and monotype prints. Unexpectedly, along my way, a reader of Dancing Girl and owner of a tour company invited me to develop and conduct a walking trip in Greece. An itinerary in the Peloponnese presented itself to me instantly, but I preferred to operate independently. In 1996, I took my first small group to Greece. Excursions & Sojourns in Greece now offers four programs—each a unique, intimate, personal odyssey. 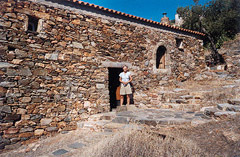 Participants in the Peloponnese Excursion will visit the house I restored in Elika. In 2007, I met Meredith Hall, renowned teacher and author of Without a Map (Beacon Press, 2007) at A Room of Her Own Foundation’s retreat for serious women writers. I invited Meredith to co-host Astra Writing in Greece, a program for women writers who like to travel. The experience, during the two years when Meredith facilitated the writing, was nothing short of magical for everyone involved—participants and hosts alike. In 2012, I assumed the role of writing facilitator as well as travel guide, and once again there was magic all around. About twenty years ago, I shelved my camera and began to paint; I set aside my tape recorder and began to write more personally. Financed in part by a grant from the Kittredge Educational Fund (2007), my most recent book, Dances in Two Worlds: A Writer-Artist’s Backstory (Fundamental Note, 2011), consists of two parallel narratives, one verbal and one visual. The book won the Colorado Book Award 2012 in creative nonfiction. With great delight, through astragreece inc.'s travel and writing programs, I share the Greece I know and love.